Not all American movies are filmed on sets in Hollywood. Some of the most famous and memorable classics have been filmed on location within the region. Robert Redford’s The Horse Whisperer, was filmed in southern Montana. Redford and his crew filmed the movie in southern Montana at the base of the Absaroka and Beartooth Mountain Ranges. Redford’s scenic spectacular A River Runs Through it was also filmed in southwest Montana. Famous feature films and countless lesser-known films and commercials have been produced in Jackson Hole, including Shane Spencer’s Mountain and Rocky IV. The westerns Missouri Breaks, Tom Horn and Rancho Deluxe. Billings hosted the epics Son Of The Morning Star and Far and Away. Devils Tower, near Gillette, was the landing site for space aliens in Close Encounters of the Third Kind. The faces of Mount Rushmore played a pivotal role in North by Northwest. Badlands National Park was the site of the 1992 film, Thunderheart. A Man Called Horse and How The West Was Won were filmed at Custer State Park. Rapid City, Spearfish Canyon and Pierre were the sites for the acclaimed Kevin Costner hit, Dances With Wolves. Portions of Starship Troopers were filmed on a private ranch in the Badlands of South Dakota, with a large portion filmed at Hell’s Half Acre in Casper, Wyoming. Return to Lonesome Dove was filmed in Virginia City, Montana. The whitewater action-adventure movie A River Wild was shot in Montana’s Flathead Valley. Idaho has been the backdrop for more than a few films. Dante’s Peak achieved its idyllic small-town setting by filming in Wallace. Smoke Signals, the first feature film to be written, directed and co-produced by Native Americans, was filmed on the Coeur d’Alene Reservation. The quirky cult favorite, Napoleon Dynamite, was filmed in southeastern Idaho. The Buffalo Bill Center of the West in Cody, Wyoming, celebrates the spirit of the American West by weaving together the stories of the western experience—history and myth, art and Native culture, firearms technology and natural history—into the rich tapestry that is the West. Make your trip complete with a stop at the Center. Named for William F. “Buffalo Bill” Cody, the man who “took the West to the world,” the Center reveals these stories of the past and present. Learn all about Buffalo Bill, his Wild West show, and the West he knew and loved. Follow his life from frontiersman to actor, showman to entrepreneur, real man to the legend he became. Yes, the West, with its rich history, fascinating natural environment, and diverse cultural heritage, comes alive at the BuBuffalo Bill Center of the West, an affiliate of the Smithsonian Institution. The North Dakota Heritage Center and State Museum, Bismarck, is a 97,000-square-foot, $52 million facility that tells the history of North Dakota. New galleries take guests through state history from the present all the way back to the Ice Age. Enjoy performances in the new digital Great Plains Theater and eat lunch at the James River Cafe. Take a journey through time at this unique museum in Rapid City, with many interactive displays, including geology, dinosaurs, Lakota culture and pioneer history of the Black Hills. During the mass overland emigration by covered wagon that began in 1841, the mountain man’s pathway along the North Platte and Sweetwater rivers to South Pass would be known by many names. The pioneers of the 1840s entered “Oregon Country” when they crossed the Continental Divide at South Pass and, thus, the name Oregon Trail was the most common and correct. In Wyoming, the stretch of the trail from Fort Laramie to South Pass is significant because it is where all the major emigrant trails come together to follow the same route. There are a number of trails leading into Fort Laramie and a number branch off from South Pass, but on this 250 mile stretch everyone “went westering” together. Knife River Indian Villages National Historic Site, Stanton, North Dakota, was established as a National Park Service (NPS) site in 1974. This is the only NPS site that preserves and protects the Northern Plains Indian Heritage. American Indians occupied this area for more than 11,000 years. There are the remains of three Hidatsa village sites within the park boundaries. The Big Hidatsa site has 110 depressions, the Sakakawea (Awatixa) site has 60 depressions and the Lower Hidatsa site has 40 depressions. This was once a thriving civilization situated along the Knife River. Sakakawea lived at the Awatixa site when she met Lewis and Clark at Fort Mandan. A state-of-the-art museum dedicated to preserving the culture of the Hidatsa, Mandan and Arikara tribes is located at the visitor center. A 15-minute video about village life can be viewed in the visitor center theater. A full-scale reconstructions of a Hidatsa earthlodge features authentic furnishings. Programs in the earthlodge are conducted during the summer months. The Native American Interpretive Center & Story of the Bison, located in Deadwood, South Dakota. Journey through an authentic Lakota Encampment with Native American Interpreters giving presentations throughout the day. 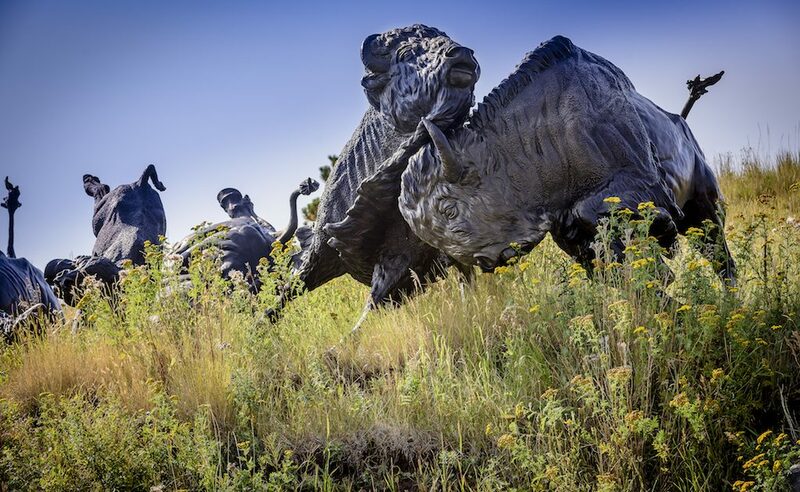 See 14 larger-than-life bronze sculptures of bison being pursued by Native American riders. Fort Union Trading Post National Historic Site was the largest fur trading post, from 1828-1867, on the upper Missouri River, near the North Dakota and Montana border. Trading headquarters with American Indians. Reconstructed Bourgeois House contains museum exhibits. Replica trade goods are available for purchase in the reconstructed Indian Trade House. The Museum, located in Pinedale, Wyoming, presents a visual and interpretative experience into the romantic era of the Mountain man and provides a comprehensive overview of the Western Fur Trade’s historical significance. Situated in the heart of the country that was once the hub of the Rocky Mountain Rendezvous system (six of the rendezvous of the early 1800s were held in the Green River Valley near present day Pinedale, Wyoming), the Museum stands as a monument to the men and the commerce that opened the West. Established in 1953, the C.M. Russell Museum owns the most complete collection of Charles Russell art and personal objects in the world. The permanent collection is comprised of over 12,000 art works and objects. 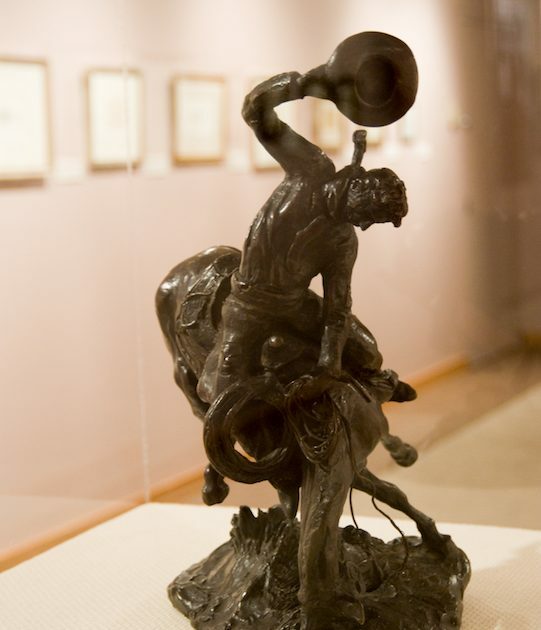 View one of the nation’s finest collections of Western art and history in spacious, modern surroundings, located in Great Falls, Montana. Also referred to as Register Cliff and Sand Point Station, Wyoming. The cliff is sandstone precipice rising one hundred feet from the valley floor of the North Platte River. Despite erosion by wind and water it remains very much as travellers on the Oregon Trail saw it more than 100 years ago. One of three main sites along the Oregon Trail where emigrants left inscriptions, Register Cliff is the closet to civilisation. 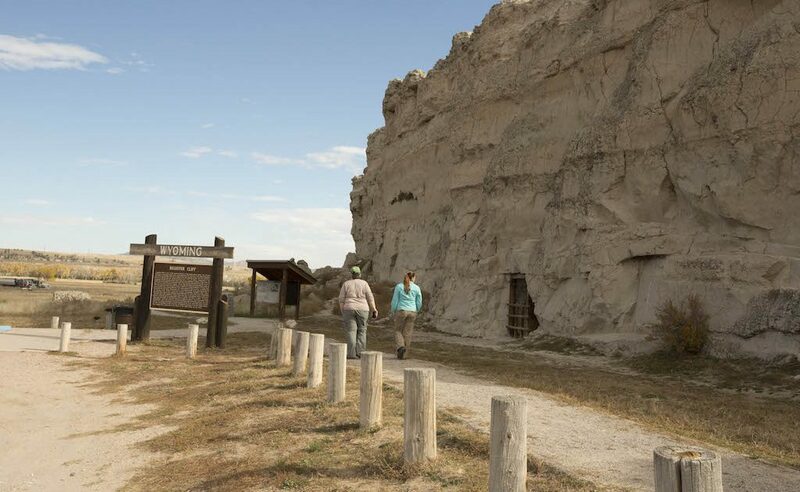 Only one night away from the safety of Fort Laramie, emigrants camped here along the banks of the North Platte River and etched their names into the soft sandstone cliff. Many of the inscriptions were made during the peak years of travel on the trail in the 1840s and 1850s. Even earlier, however, as far back as 1829, trappers and traders passing through carved their names into the rock. A small trading post was located near the cliff. In 1861, it was turned into a Pony Express stop, and later a stage station. A walkway and informative sign at the base of the cliff enable the visitor to learn more about this historic site. Tour a reconstructed 1865 military post located at a major river crossing on the Oregon, Mormon Pioneer, California, Pony Express, and transcontinental telegraph trail corridor. Explore central Wyoming’s regional history museum, featuring exhibits on prehistoric peoples, Plains Indians, ranching, the energy industry, and the City of Casper as well as the western emigrant trails and frontier army. Listed on the National Register, visitors can tour the restored prison, near Laramie, where famous outlaw Butch Cassidy spent 18 months, the furnished Warden’s House, and interactive Broom Factory. Come and be captivated by this dog- and family-friendly attraction. An exhibit hall features rotating displays and a family friendly scavenger hunt. Self-guided tours available in English, French, German, Spanish and Japanese. Guided tours are also available for school and educational groups with reservations. Stops along the tour include the restored warden’s house, prison cells, dining area, guard’s quarters, infirmary, women’s quarters, laundry room, warden’ s office and working broom factory. 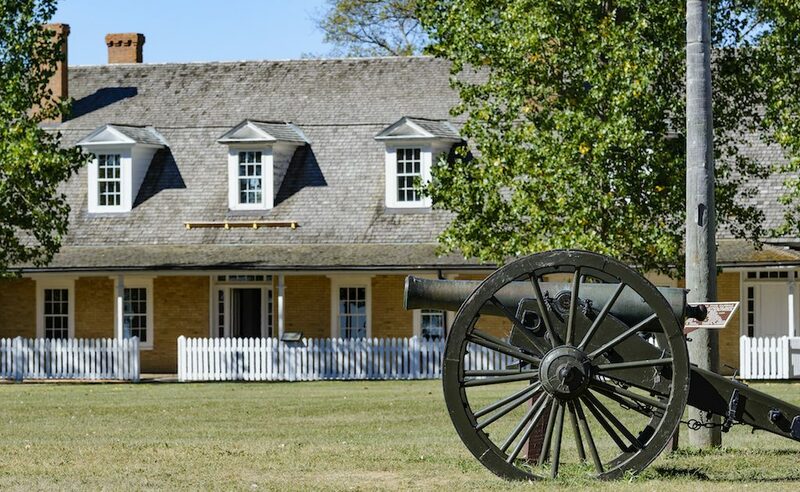 The history of Fort Sisseton, near Britton, South Dakota, stretches back more than 130 years, when a series of forts were established in eastern Dakota Territory under the direction of Major General John Pope. While in operation, the soldiers stationed at the fort ensured safe passage for settlers, surveyors and others into the Dakota Territory. In 1959, the fort was designated a State Historical Park. This 1864 frontier army outpost has 14 of the original buildings still intact. Today, the park offers camping, cabins and special events such as the Fort Sisseton Historical Festival. Held annually, the festival features black powder shooting, a flag raising ceremony, cavalry and infantry drills, a grand march and several demonstrations. Experience history, don’t just read about it. Thousands of people traveled the Oregon, Mormon, California and Pony Express trails in the 1800s, etching their stories in American history. These tales are told through the facility’s seven interactive exhibit areas and 18-minute multimedia presentation. The National Historic Trails Interpretive Center, located in Casper, Wyoming, is public-private partnership between the Bureau of Land Management, the National Historic Trails Center Foundation and the City of Casper.